Why assistive technology for music – what is the justification? First, it is more than just a good idea, it is the law: “In addition to IDEA 2004 [Individuals with Disabilities Education Act], two other federal laws have had an impact on the provision of assistive technology to students with disabilities, Section 504 of the Rehabilitation Act of 1973…and the Americans with Disabilities Act (ADA) of 1990…"  Together these laws ensure that special needs students have equal access to education. Music is part of that education. Kimberly McCord points out that “Children with disabilities can be found in every music classroom…However, learning disabilities are harder to recognize and…the literature on musical creativity offers little guidance for educators in designing music lessons for children with disabilities." John Brockhouse also writes, “…the opportunity to learn a musical instrument is a basic human right which should be available equally to children attending…schools” (2006, p. 20). The purpose of the following is to provide a variety of assistive technologies that can be used with special needs students in music activities. Dell et al. states that an assistive device “…must have an impact on the functioning of the child with a disability" (2008, p. 4). In music, assistive technologies should enable a child with disabilities to participate in music activities. These music assistive technologies will be discussed across a continuum from low to high tech, as defined by Dell et al. : “Low-tech devices use no electronic components…relatively inexpensive…High-tech devices…are based on computer technology…more expensive…require more training…Mid-tech devices are electronic…but are much less expensive and require less training than high-tech devices” (2008, pp. 5-6). In designing any technologies to assist in making it possible for any disabled student to participate in music activities, first work with occupational and physical therapists who can often create inexpensive alternatives to expensive specially made technologies. Also, one can look at what might be available through commercial products, e.g., Wii music [music] , instead of otherwise more expensive specialty technologies created for the learning disabled community only. In working on notation, some simple solutions include providing students with enlarged manuscript/score paper. [score]  Pencils with appropriate grips can also aid students in the writing process. Instructors may also wish to create Velcro type boards on which students can place notes; this is helpful for students with compromised motor skills. Even easier than working with a Velcro board is the old-fashioned vinyl Colorforms [colorforms] ; there is a set available from which the music instructor can construct a staff and notes.In the area of music performance there are a number of low-tech instruments that would enable a student to participate. Because these instruments enable a child with disabilities to engage and learn, they fall into the category of assistive technology devices. A musical instruments station [station]  [basics] , consisting of percussive-type instruments, also enables students with motor skills issues to participate in a performance. Percussion family instruments also enable students with cognitive disabilities to still be a part of the performance. One easy to grip instrument is the bell[bell] ; although each plays a particular pitch, a student with cognitive disabilities can be given one bell, and cued when to perform, thus enabling performance without the specific knowledge component of pitch. Lastly, electronic bongos[bongo] provide both pitch and non-pitched sounds. switches, which are a way for the severely disabled to participate in music performance. Rhythmic accompaniments can be created through the software program, Band in a Box [BAIB] , and then activated by the user through a switch. There are many types of switches, and instructors need to use the one that best meets the abilities of the student. The following website offers information about various types of switches and how to install and use them: http://www.northerngrid.org/ A music teacher, known as Dr. Laz, demonstrates the use of switches to engage severely disabled students in music making (Embed Youtube: http://www.youtube.com/watch?v=afKfSPvYQ3M  Available assistive technology for aural disabilities is all but impossible to find, since the popularity of cochlear implants. Certainly, earphones and hearing aids of various types are still used. In music, it is understood that the hearing impaired can hear the music by feeling it, feeling the vibrations of music: "Deaf people love music just as much as hearing people do...they just understand it differently. They can feel it." (Ell, 2005). However, many times the music education of the deaf has been more about the socialization in music making rather than bona fide music education (Burgin, 2008) . 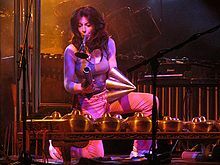 Percussionist Dame Evelyn Glennie – probably one of the most recognized hearing impaired musicians of our times – makes this distinction between the socialization process and the education process as music therapy and sound therapy, respectively; her Disability Essay concurs with Burgin that music for the deaf can, and should include a thorough music education. That being said, there are a number of assistive technologies for the hearing impaired. In her article, Music Instruction and the Hearing Impaired, Eugenia Bulawa Walczyk emphasizes technologies that can be used in an assistive capacity to ensure a complete music education for the deaf: signing will singing, use of piano keyboards for learning pitch and duration, use of music software programs so that students can connect the sound of music notation/duration to the visual score (1993, p. 42-44) . In my opinion, the most important feature of any assistive technology for music is that it is content driven, and not just making sounds through cause-and-effect technologies. It is also important that disabled students be given a variety of sounds to experience and to perform. As pointed out to me by a friend with a child with Rett’s syndrome, too often such students are given the same instrument in every music making experience; it is not surprising that the student then becomes disinterested in music making. Also, the use of assistive technologies in music must go beyond music therapy. While all music making can be therapeutic, the music class is about learning content and not just experiencing feelings about a sound. For more information – which is updated continually – please go to http://delicious.com/jenmusician ; look into the assttech (assistive technology) and musicassttech (music assistive technology) bundles. I would be very interested in anyone contacting me to share more information on this topic: jcollins@po-box.esu.edu or jenden@ptd.net. ↑ McCord, K. Moving beyond "that's all I can do:" encouraging musical creativity in children with learning disabilities. Bulletin of the Council for Research in Music Education, 1-10. ↑ Brockhouse, J. Getting better all the time: using music technology for learners with special needs. Australian Journal of Music Education, 1-12. ↑ a b Dell, A., Newton, D., & Petroff, J.G., . (2008). Assistive technology in the classroom. Upper Saddle River, NJ: Pearson Education. ↑ Wikipedia. (2010). Retrieved from http://www.wikipedia.com. This page was last edited on 17 October 2013, at 00:35.